Our old pal Speedycop, the 24 Hours of Lemons legend who’s built an upside-down Camaro, a Cessna airplane-car, and one of the finest Family Truckster replicas in the free world has an exciting new project: turning a Vietnam-era helicopter into a Lemons race car. The chopper is a 1969 Bell OH-58 Kiowa Racecopter, so already that name sounds nice and quick. The helicopter did service in Vietnam before becoming a police helicopter, and appears to have been out of service for a while. The chopper’s body will be mated to a 1985 Toyota Van Wagon chassis, possibly running a ‘91 Previa engine with over 300,000 miles. I can almost taste the raw speed just by typing these words. It’s worth remembering that the Van Wagon platform is mid-engined, as are most serious racing cars, so that alone should all but guarantee victory for this unholy hybrid. A helicopter body should be quite light as well, and it’s got to be at least a little bit aerodynamic, so who knows? Maybe this thing will be a monster on the track. Expect a significant twist when it debuts at CMP April 29th! ... so who knows what that may be! I think Lemons rules forbid swirling helicopter blades, so it’s probably not that. Maybe he has a real predator-alien in captivity, and will release it on to the track during the race? I’m excited to see what happens. 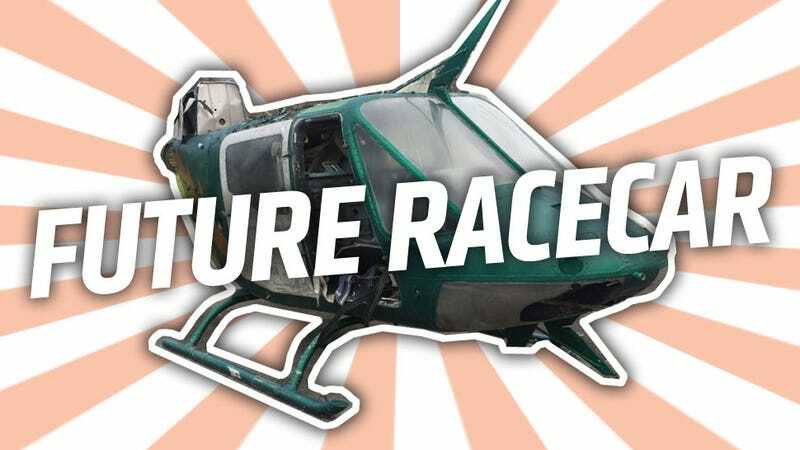 Speedycop’s record for turning no-longer-airworthy aircraft into Lemons racers is second to none, so I’m confident this chopper will be roadable before too long. We’ll keep everyone updated, and I’ll start pestering for my chance to drive it now.